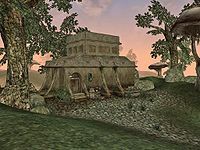 Gro-Bagrat Plantation is a plantation home north of Vivec. It is the home of the Camonna Tong thug Gurak gro-Bagrat. Five guards are on the premises, though there are no farmers in sight. The main crop on the plantation is the shrub Willow Anther, and there is a Skooma factory in the basement. This page was last modified on 5 December 2018, at 22:15.